Fulcrum Lifting’s annual sales meeting was held in Clarksville, IN January 24-25, 2019. 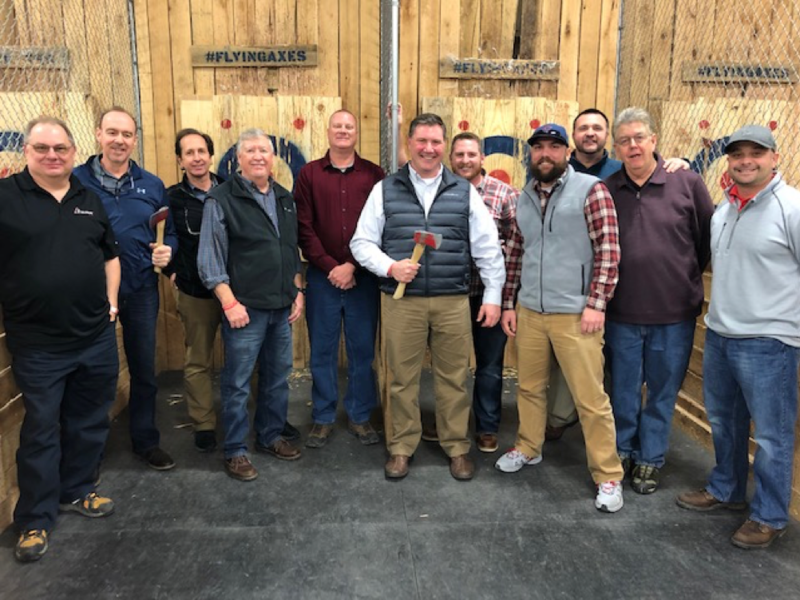 In addition to some fun team building activities (thanks to Louisville’s Flying Axes and Against the Grain), we welcomed a few of our newest team members from our new location, Vernon Lifting Products. As mentioned in our December newsletter, Vernon brings some new products and capabilities to Fulcrum Lifting and our sales reps were eager to learn more about them. Larger capacity wire rope fabrication, multi-part wire rope slings, and synthetic rope fabrication are just a few of the new offerings now available through each of the Fulcrum Lifting locations. Looking back to 2018 brought many successes and new product offerings to Fulcrum Lifting. We had a great year with both the Enerpac/Simplex Hydraulics product line as well as the Enerpac Bolting Tool offerings. Our KWR location continues to show tremendous success with professional and timely repairs and will continue to be an Authorized Repair Center for both brands. A large commitment to 3M Fall Protection also highlighted our year. Having a good selection of products in stock at each of our locations was a goal achieved and we look forward to providing Fall Protection to more of our accounts in 2019. Rounding out our 2018 highlights was our commitment to CM Hoists, and now for 2019, Harrington Hoists. Each of the Fulcrum locations are determined to stock and service the top brands with each of the manufacturers we represent. The old adage “Price, Selection, Service: choose any two” is NOT the goal of Fulcrum Lifting. Fair and competitive pricing, the selection our customers want, and the service our customers demand – this is and will continue to be our objective! We are very excited to share with each of our accounts what we’ve learned and to show you what’s new. Please contact your sales representative for a visit today!